So, if you haven’t contributed yet, please do so soon. 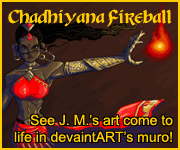 Simply click on the Chadhiyana perk, and it will bring you to a page to complete your pre-order. You’ll not only get the Chadhiyana trade and the comic, but you’ll be supporting diversity in publishing, which is the main mission of Rosarium, and help them reach the match-goal Mr. Riordan generously offered.